Meet Alek, Anjali and Anya. They’re a young couple with a little dog. 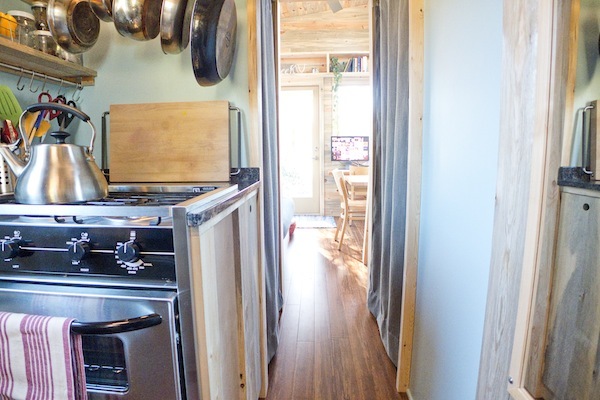 And they’ve been building they own mortgage-free tiny home on a 8×20 trailer. It was designed in SketchUp and every little bit of the process has been documented on their blog. And much more! Best of all the house is mortgage-free. What would you do without expensive rent or a mortgage? I love how they have built-in bookshelves and storage just about everywhere. And it looks GREAT, too. When you walk in you’re in the living room. Upstairs the loft (I’ll get you up there in a minute). => Get the plans to build this tiny house yourself. Learn more about The Tiny Project: Less House. More Life. Alek’s Tiny House Plans For Sale (Includes Construction PDF and SketchUp Files). “Like” their Facebook Page here. If you enjoyed The Tiny Project you’ll love our free daily tiny house newsletter with even more! A beautiful job…!! Neat as a pin! Glad you liked it, I think it’s neat too.. One of the cleanest. AND they’ve been living in it. one of my all time favorites! 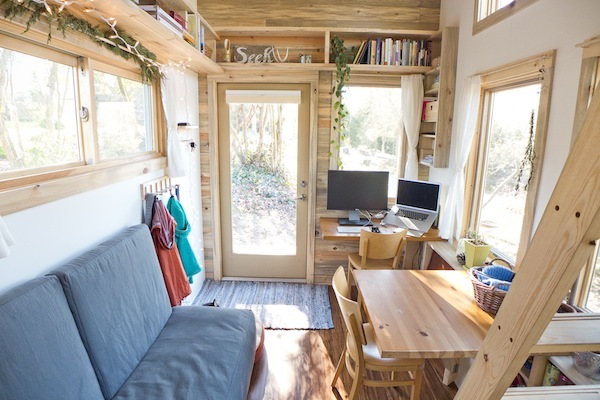 definitely gonna steal some of the great designs and idea for my own tiny house! One of my all time favorites too! does anyone know where to find this type of house plan? i love this home and plan on building my home in a month or so. i need the plans to get started………. CAN ANYONE HELP??? i love your home! great story!!!! im not a builder so basic lines are the best to get started………. Hi there. I do not currently have plans in the proper format to sell. Bookmark http://tiny-project.com as I will post them there when I have them for sale. thank you alek for answering my question! you have a grand home. before plans are for sale ( which i would love to be put on the list when you let people know they are for sale) could you tell me now what size was the trailer, how long is your home and the width??? at least i can but the trailer and get it out of the way. maybe give me a short list of things i will need to shop for……any help would be grand! thank you again! and HAPPY NEW YEAR TO YOU AND EVERYONE ON HERE!! Beautiful place! Just wondering what your rent on the space is and how you found it. We pay nearly nothing and are doing yard work in exchange for us living here. It’s an amazing situation and we are very lucky. We have the most generous, kind-hearted hosts! We found a place to live by posting a detailed post on craigslist and other forums. A few potential hosts then found us! thats great finding a great place to park. i have been reading all the tiny homes blogs and newsletters and it does seem to be a problem finding a place to put it? im hoping to leave arizona and go to washington or oregon and walk the beach with my dog and enjoy life for as long as i can. ( im ill and it isnt going away). how would i find a place on the coast? can we put it on land if you but some? what are the rules about tiny homes? can you park them in RV parks or do they shy away for us being there? We parked the house in RV parks during our whole trip from the widwest to NorCal. You should definitely be welcome in an RV park, though I don’t think there would be many that you’d want to live in more permanently. Check other state and local laws to see what might be legal where you live. 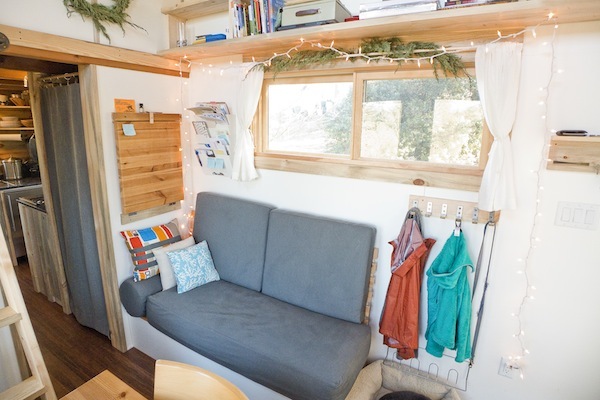 There are a lot of rules about living in tiny houses, because they are usually thought of as RVs by municipalities. RVs generally can’t be lived in full-time. There are some gray legal areas you need to navigate. That’s an awesome little bedroom! Love the rug, and the storage space. too. What more could one want? Great job, folks. I think they did an incredible job too.. Thanks 2BarA! We are looking into living in a self-designed RV for a while and have been looking at these designs for inspiration. Very nice! 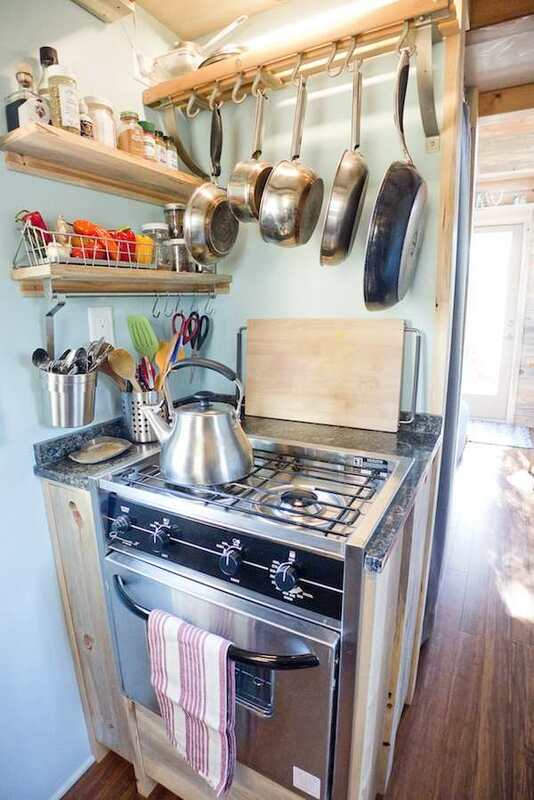 I would add a swing-out side counter next to the stove —and what kind of STOVE is that anyways??? ?—most RV’s are lacking in good design and actual USEABLE space. One thing that makes me nuts is the absurd stoves in them—three burners in an odd space wasting configuration!—and NO counter space. Form or function? Function for me everytime! I would like to know who the stove is made by thanks!!!! Love these compact little houses…little earth impact. However, though there’s no mortgage, there is the property to find to put it on, and property is pretty high priced if one wishes to live near a library and theater! True.. Although it can be (and has been) done. Thanks, Rob. What a wonderful jewel of a home. Quaint, classy and very comfortable. This is the best design I’ve seen so far. It’s very livable and so attractive. Looks so comfortable. They thought of all the day to day things that need places and planned where to put them. And you can actually cook in that kitchen and sit up in the bed without clumking your head. I love the number of windows also. No claustrophobia here! Thanks Grace. I think I’d enjoy it a lot too. Well said, Grace. Seems very liveable. The extra steps taken to create defined rooms instead of spaces makes each room really inviting. The use of natural light via windows is very enticing (though without adequate siting with shade it looks like it could heat up like an oven in the summer). 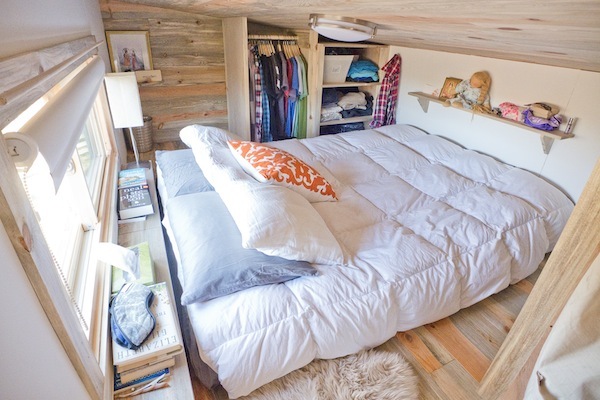 The semi-enclosed loft space feels more like a bedroom than most loft bed areas. The kitchen appliances are scaled down in size but not function and while the overall space is compact, it affords plenty of room for food production. Only quibble there is the built in stainless steel drainboard: too much counter real estate taken up that would be better spent on a bigger sink or extra countertop IMHO. 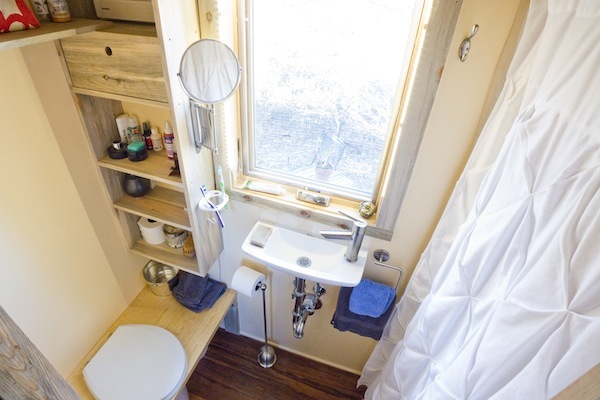 That bathroom arrangement is stellar, again with great window space and a tiny sink that is all that is necessary for washing of hands and face. Really nice work and definitely in my top five designs. I think your house is so beautiful! I wonder are there files in the US Cor building a house like that? I live in the north of the Netherlands and here there are so many rules. Anyway, very nice house you have there and what a beautiful place to live. Whishing you all the best for 2014. Thanks, Gees. We still have lots of rules down here but there are ways in some areas to do it successfully. For the most part, since tiny houses are not on permanent foundations, they technically don’t need to meet code and don’t need to be inspected. That said you should always build to code if you can and have your electrical work inspected by a licensed electrician to be safe. This by itself is a major selling point, as it saves a lot of costs normally associated with building. The trickier part is then find a legal place to live in it once complete. LOVE all the windows and looking closely near the kitchen you see a mirror which is a brilliant idea for creating more light in a small place. Also love the small sink in the bathroom and the entire stove area and how its laid out and being used. May I ask where the washer dryer is? I think I missed that photo. Very nice. Well thought out use of space. Open shelving in kitchen, windows lend to “large” sensation. Mama needs a flusher and no loft, but this is nice! LOVE! 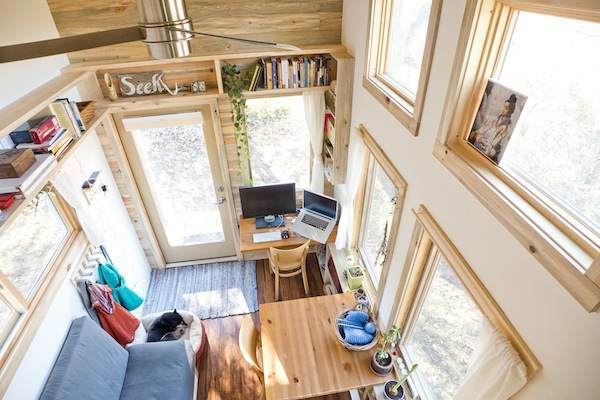 This is definitely in my top three favorite tiny house designs. I love the way you made a space on the back for the tanks and what looks like your trash/dumpster with rails around it – genius! I love all the windows, there is so much beautiful natural light coming in! Your loft is also one of the most spacious I’ve ever seen, it’s not the angled roof that most have, where you wack your head if you try to sit up – awesome job! I also love the little mirror and the small sink in the bathroom – genius! 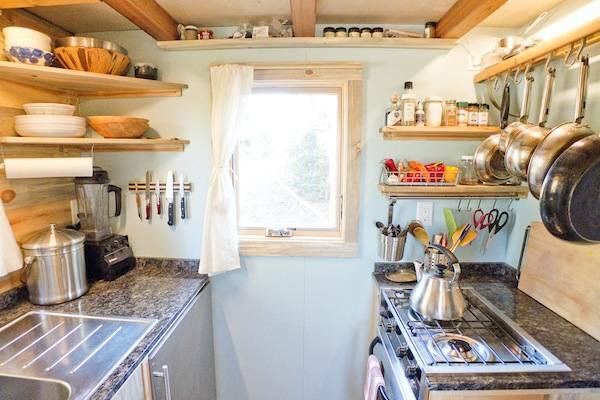 I’ve seen other tiny houses with no sink in the bathroom at all (I guess they wash up in the kitchen sink?) so that’s a big plus. Anyway, love it, hope I can have one just like it someday! I assume they own the land? You do need a place to park your”HOME”. It appears that many of these are parked in someones back yard? And you need hookups to function. Its a very nice design and well finished. Please, tell me where to get that bathroom sink! PLEASE! I would like to know about the bathroom sink too. I’ve seen lots of tiny houses on trailers and I am wondering where does the waste water go. When you build a tiny house on a trailer do you build it with holding tanks like an RV? Love the Tiny House Newsletter! So nice….I could live there very happily. Beautiful job! Great, job well done Alek thank you and yours for sharing your home with us. And thank you Alex for sharing their story as well. Thank you also for the link for the stove. I like the sink but the oh so modern faucets, don’t appeal to me, I like the goose neck type for the kitchen 🙂 or the ones that are thinner in the pipe hehehe. God bless all of you. Happy Trails! I have always love this tiny house, especially the kitchen and bath which are in my favorites list. If this is lived in, then you live quite well and organized. It’s gorgeous! I have NEVER said, before today, what I’m about to say, “I would love to know this couple!” Anyone who has that many windows and such a killer kitchen for the serious cook is a kindred spirit of the highest order! Very nice that they lived in their new home for a month and then took “real life/lived-in” photos. 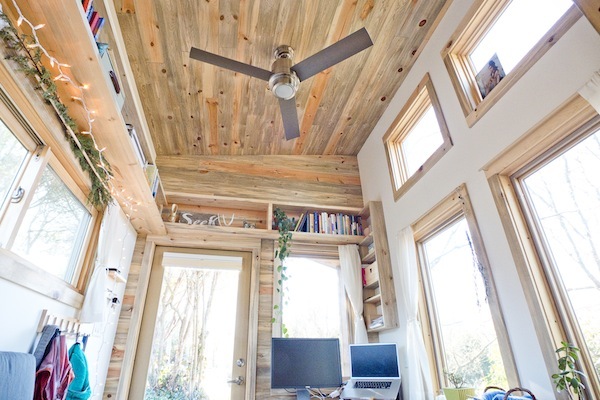 I love looking at all tiny homes but have wondered what it would look like after the “staging” phase was over and they had been lived in. Nice floor plan also. Love the loft. Thanks Barbara, I agree! And their tiny home is just awesome isn’t it? Someone already asked this and it was not answered; but, I, too, would love to know how the sewage is dealt with. Do they have storage tanks for grey water? And if they are parked in someone’s back yard how do they access electricity and water? Salut, j’adore votre petite maison , sa chambre à coucher va m’inspirer pour un de mes prochain projet de cabane. Belles journées à vous, amicalement. Man, this is wonderful! Love the “Seek” sign, all the windows (does it get cold), the decor, books, etc., etc. When can I move in? LOL. I really like this one, too,. I love the bedroom. It makes me more comfortable with the idea of a loft bedroom. I can’t wait to start my tiny house move. Hi, love the house it has been quite an inspiration for my own tiny home! What is the weight of the house? Was this a 10,000 pound axle trailer it was built on? I love the layout! I would want a larger fridge and stairs for my tiny dog, but I think I could figure that out! Nice! 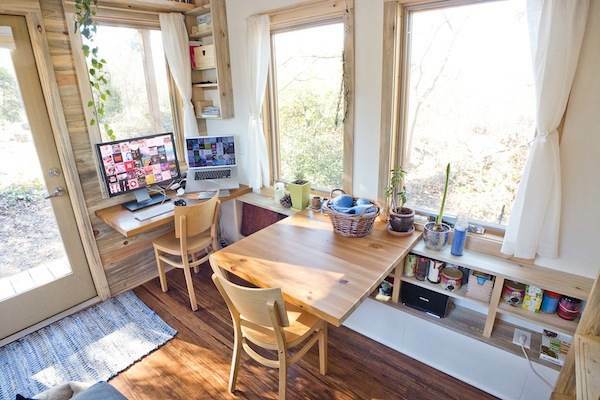 I first saw this great home nearly 3 years ago, right here on tinyhousetalk, and I have to say it remains one of my absolute favorites. Top of the list for livability as welll as beauty! I am curious — is the couple still living in this home? If so could we get a follow up article with their feelings after 3 years? I would love to hear how tiny living is working out for them. Can’t really tell what everything is running off of. I think if I wasn’t living off-the-grid I would just choose electric for everything. Just easier. Even solar has its share of problems with the batteries. A small well-insulated space shouldn’t be that much to heat. Water heater would be on-demand, stove would be induction. There would be a savings in cost of appliances. Dealing with propane is a bit of a hassle–and sometimes the tanks do explode. For me hot heaters don’t do well in small space. Risk of fires, burns, pets catching fire….health reasons… And if I did I would pipe in outside air to feed it and make sure it’s airtight. But just my 2 cents. Love this. Planning on buying the plans soon. What was the total estimated cost To build? Wanna make sure we plan accordingly. Thanks! I have always love this very tiny house! I really like the loft space. 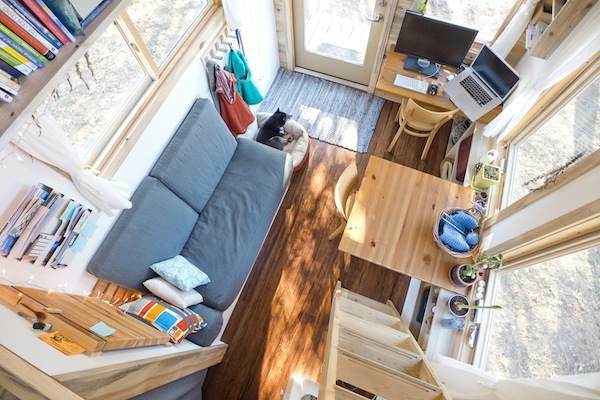 There are too many tiny homes with lofts that you can barely sit up in, let alone move around. This is a winner.